An exhibition of 30 images by participants in the 9th annual South Side Photo Walk will be on display beginning Thursday, Sept. 6, and continuing through the month of September in The Link Gallery at the Nancy Cantor Warehouse, 350 W. Fayette St., Syracuse. The Photo Walk—organized by The Stand/South Side Newspaper Project—took place on Saturday, July 28. 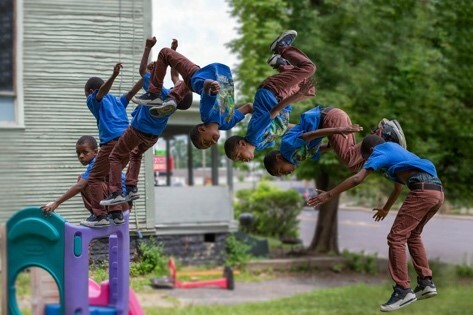 Individuals of all skill levels and ages were invited to explore and document a typical Saturday in Syracuse’s South Side. In March 2018, the South Side Newspaper Project was one of seven awardees of a Finding Common Ground grant, which offers funding for recipients to engage in meaningful and civil dialogue with the communities they serve. The grant enabled organizers to expand the Photo Walk project by printing, framing and exhibiting selected photos. In addition to The Link Gallery exhibition, 10 photos will be placed on permanent display in five South Side locations: Beauchamp Library, 2111 S. Salina St.; Blue Brothers Barbershop, 2036 S. Salina St.; Colonial Laundromat, 3901 S. Salina St.; Cut Kings, 2850 S. Salina St.; and the Elks Lodge, 3815 S. Salina St.
An exhibition reception will take place on Sept. 6 at 6 p.m. in The Link Gallery. Complimentary refreshments will be provided. The Stand t-shirts will be available for purchase, and orders will be taken for image reprints. The Link Gallery is accessible to wheelchair users via a street-level power-assist door adjacent to The Window Projects Gallery on West Fayette Street. For more information or to make arrangements for groups with special needs, contact Greg Munno at 315.730.4621. For more information on The Stand, visit MySouthSideStand.com.